Though classified as an enigmologist, Jeremy Logan comes to an artist’s colony in the heart of Adirondack State Park as a historian. In the park’s relative peace, he hopes to find the incentive to finish a monograph fighting completion. If he can’t do it at Cloudwater, it simply won’t get done. Jeremy’s reputation proceeds him, however, and Greg Hartshorn, Cloudwater’s resident director, voices the hope he’s left his endeavors as an enigmologist at the retreat’s entrance. Though he assures Hartshorn he’s going to work on his monograph and nothing more, Jeremy soon finds he lied. Randall Jessup, an old friend from Yale, now a park ranger, is waiting for him at his cabin. Cloudwater may be isolated, but the park is anything but peaceful. There have been several deaths, vicious killings of backpackers, all centering around Desolation Mountain in the Five Ponds Wilderness area. First conclusion is a rogue bear, then perhaps a wolf, but Jessup is certain something else did the killings, though he doesn’t dare put a name to it. There’s a family living near Pike Hollow, clannish and isolated. They’ve been there for generations, and as expected, rumors have grown up about them. The Blakeneys are disliked by everyone, as well as feared. Jessup is afraid they’re going to be accused of the killings. Accepting the others’ prejudice with more than a grain of salt, Logan attempts to communicate with the Blakeneys and is forcibly rejected. His explorations take him nearer the mountain where he discovers the one man who’s been halfway a friend to the outcasts, author Harrison Albright. “‘they believe the Blakeneys are . . . well, werewolves . . . I want your opinion. The attempts of rangers and local police to solve the murders becomes a witch hunt. Not only the Blakeneys are accused, but also Saul Woden, recently released from prison after committing murder. Not so blatantly dangerous but also mysterious is the research lab near the mountain, run by the daughter of Chase Feverbridge, a researcher driven to suicide by ridicule from the scientific community for his study of moonlight and its effect on animals. That fits in all too well with the hints of a supernatural cause for the killings since all occurred on full moon nights. Though he’s aware of the legends of werewolves and the scientific causes of lycanthrophy, Logan tells himself he’s educated enough not to believe a man can turn into a wolf, but his experiences as an enigmologist say otherwise. Then another killing occurs, this time, Laura Feverbridge’s assistant. That makes two people associated with the experiments who’ve died . . . three, including Laura’s father. Chase Feverbridge managed to get inside the Blakeney compound. He came away with “specimens” . . . of what? Convinced the Blakeneys and Feverbridge’s research are involved in the deaths, Logan attempts to discover the clan’s secret. And then, the killer strikes again. Calling on Harrison Albright, Logan convinces the writer it’s up to them to discover the truth, no matter what the cost before the wrong person is arrested and more people are killed. With a new twist on the werewolf legend giving it originality and a plausible explanation, author Child pens a chilling and suspenseful story. Though the climax carries a bit of the usual cliché, that doesn’t in any way detract from the narrative or the method in which the killer’s identity and the Blackneys’ secret is handled. Add to that the “forest primeval” descriptions of the park, Jeremy’s recollections of previous visits there when younger, and his own reactions to the incredible truths he discovers and the result is a frightening, exciting tale. Lincoln Child’s collaborations with fellow author Douglas Preston may be superb thrillers, but his solo novels are chilling and occasionally terrifying. 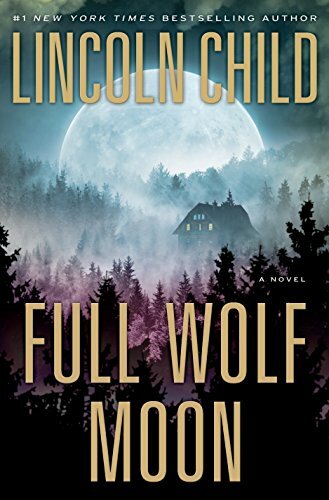 As the fifth entry in the Jeremy Logan series, Full Wolf Moon will undoubtedly encourage the reader to seek out and enjoy the others.